Déjà Vu: The 2004 Video Execution of American Hostage Nick Berg. Was he Killed by US Intelligence? The video of execution of American hostage Nick Berg in Iraq is threatening to develop into a major scandal. During a press conference the father of the beheaded American accused Bush and Rumsfeld of killing his son. There are more and more suspicions that Nick Berg was really executed not by Arab militants, but by the US intelligence services in order to divert the attention from the scandal about the tortures in Baghdad prison. First there was a report that a video showing an execution of an American expert captured in Iraq was shown on a so-called ‘Islamic extremist’ website. It was reported that the execution was carried out by a group of guerillas tied to Al-Qaeda in order to take revenge for the tortures that the American soldiers did to Iraqi inmates. The video shows five men, whose faces are hidden behind black masks and traditional Arab scarves. They all are standing around a tied-up man with an orange suit on, the kind of suit inmates wear. The victim says to the camera: «My name is Nick Berg, my father’s name is Michael, my mother’s name is Susan. I have a brother and a sister, David and Sarah. I live in Philadelphia ». After these words they got him down on the floor, put a big knife to his throat and cut his head off, while screaming ‘Allah Akbar’ (‘God is Great’). The video footage was called «Abu Musab Al-Zarqawi shows killing of an American». A day before the video was shown, Mr. Berg’s parents were told that their son’s body was found near a highway in Baghdad. The scene of the execution and the comments on it were the number one news in the world’s mass media for some time. Then the CIA experts released a statement saying that Abu Musab Al-Zarqawi was the man in mask who beheaded the US citizen Nick Berg in front of a camera. Then Western commentators and moralists took over and launched a campaign to vindicate the Americans exposed for torturing Iraqi inmates. Compared to the brutal murder of an American with cutting his head off, the tortures of Iraqis in prisons started looking like minor pranks of undisciplined soldiers. Another factor was that the beheaded victim was a Jew, which was picked up by the Zionists immediately to justify their actions and to show what kind of enemy they have to be dealing with. However, so many questions arose about the videotape that all accusers of so-called ‘Islamists’ got quiet right away and the subject disappeared from the agenda in the world’s media. Many questions came up, and they are all pointing out that the accusations by Mr. Berg’s father against the US authorities on killing his son have very serious grounds. The first suspicion was caused by a video where Berg was wearing an orange American jail suit. Berg was arrested by the Americans and had time to tell his friend that he was in an American prison. Intelligence services were denying this and were saying that Berg was arrested by the Iraqi police for Israeli stamps in his passport. But later on it turned out that he was questioned by Americans, and FBI agents came to his parents’ house to find out whether he was involved in any terrorist activities. Berg’s e-mail showed that he was held in custody by the Americans. Turned out that an American was held in an American prison and beheaded right after he was presumably released. In this connection there is a question whether the American was released from prison at all. 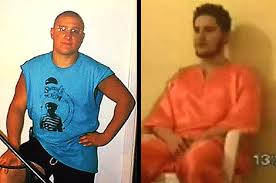 If he was, and if he was late for his flight because of the arrest, as his parents first claimed, then why he ended up being captured by ‘terrorists’ and dressed in an American jail suit? How would militants even get a suit like this in the first place, and why would they make their hostage put it on? The experts who saw the video say that the man posing as Jordanian native Zarqawi does not speak the Jordanian dialect. Zarqawi has an artificial leg, but none of these murderers did. The man presented as Zarqawi had a yellow ring, presumably a golden one, which Muslim men are banned from wearing, especially so-called fundamentalists. The experts mentioned that the man calls Prophet Muhammad (peace be upon him) ‘Gracious Prophet’, while it is only Allah, Whom Muslims call ‘Gracious’. More and more questions are coming up about Mr. Berg’s murder and some of them have already been presented to the country’s leadership by the American public. But major American mass media, which support the war in Iraq, are ignoring this information. Infowars.com published the material titled «This is a 98 % secret US operation». The chair that Nick Berg was sitting on before the execution was the same as the chairs in Abu-Ghraib prison, where tortures were being committed. These chairs were brought by the US army. It was also reported that even though Nick Berg was a civilian, for some reason his body was delivered to a US Air Force base in Dover, where the dead servicemen are brought. Meanwhile more and more new circumstances are being revealed when the video is being studied. The doctors are saying that there is almost no blood shown during the beheading, while normally a lot of blood would have been gushing if the person were alive. No blood was seen around it or on the hands of the one who cut the head off. Then it must have been a dead person who was beheaded. All militants filmed on the video footage are too fat for the Iraqi standards, especially for militants, and they all had white palms of their hands. When the video was studied it turned out that the scream shown in this footage was recorded earlier and it was probably a woman’s scream. The weapons that the murderers were holding in their hands resemble AKs, but the experts claim that this is a modified AK-47, Israeli-made Halil. All Islamic organizations, including the ones accused of terrorism, have condemned this act. Nothing has been heard about Abu Musab Al-Zarqawi for the past few months, and there has been a rumor going on that he died in a bombing. If he did take part in beheading the American and wanted to make it known this way (even the video was called «Abu Musab Al-Zarqawi shows killing of an American»), then why did he need to put a mask on or close his face with a scarf? But if he has nothing to do with it, and somebody decided to use his name, then it would be quite natural to expect Zarqawi to deny the allegations about his involvement in Mr. Berg’s execution. But no denials have been heard. Especially when such a denial would have been appropriate after all Islamic organizations and the Iraqis condemned this murder. This fact means that Zarqawi may not be alive. Those who put on that show knew that Zarqawi could no longer deny whatever they accuse him of. Will the US government be able to deny what Mr. Berg’s parents and the public are accusing it of? Probably, the experts, who manage to find Arab passports and the Holy Koran under a tumbled-down and melted skyscraper, will make something up this time as well? If they don’t, they you should expect some new movies and new terrorist acts to be made by the joint effort of Hollywood and the CIA.